Yikes - It's Next Wednesday! I don't know about you but sometimes I get a little overwhelmed by Christmas. Don't get me wrong. I love it, I really do. I love the decorating, socializing, and celebrating. It's just there is so much in so short amount of time. Couldn't we spread it out a little more? So in mid-week of the fourth week of Advent, my personal challenge is to take a deep breath, relax, and enjoy the procession of the season rather than rushing ahead and creating my own anxiety and panic. After all, Jesus did say, "Don't worry about tomorrow because today is enough on it's own." Yes, Christmas Day is one week from today. Don't panic! Relax and enjoy the journey to Bethlehem! We decorated our Christmas tree a couple of days ago with the customary lights and ornaments. Hanging the ornaments on the tree is always a time for us of remembering the people, places, and times the individual ornaments represent in our lives. There are ornaments from my childhood, some handmade by friends and family, ones given to commemorate each of our daughters' "first Christmases," several made by our daughters when they were children, and numerous elaborately jeweled ornaments made by my Aunt Clarice that were artistic expressions which began as therapy for a mental disorder. There is the flying cardinal that is always among the first on the tree to remind us of Peg's father and how he loved Christmas. For some of the ornaments we have forgotten their origins. Their significance lies in always being on our tree and bringing smiles to our faces. Who knows, they may one day be memories to our daughters or others. The Christmas Tree brings light into our home far beyond the tiny electric bulbs strung through its branches. It also lights our lives with the presence of people, places, and events who visit us this time of year bringing smiles, joy, comfort, and even sadness, all reminding us of the fullness of our lives. Perhaps the Angel who is lastly and ceremoniously placed atop the tree reminds us that all of the ornaments are Angels in themselves. As we enter the time of year when numerous religious, spiritual, and cultural holiday celebrations occur, the annual discussion of "what do we call it?" has begun. Do we say "Merry Christmas" or "Happy Hanukkah" or "Happy/Merry/Joyous 'fill in the blank'", or do we simply try to include everything and everyone with "Happy Holidays?" Even within our respective traditions there is consternation over what to call certain days and when to observe them. For example in my Christian tradition, is it OK to sing Christmas Carols during Advent? Do we dare speak of magi and a star before Epiphany? 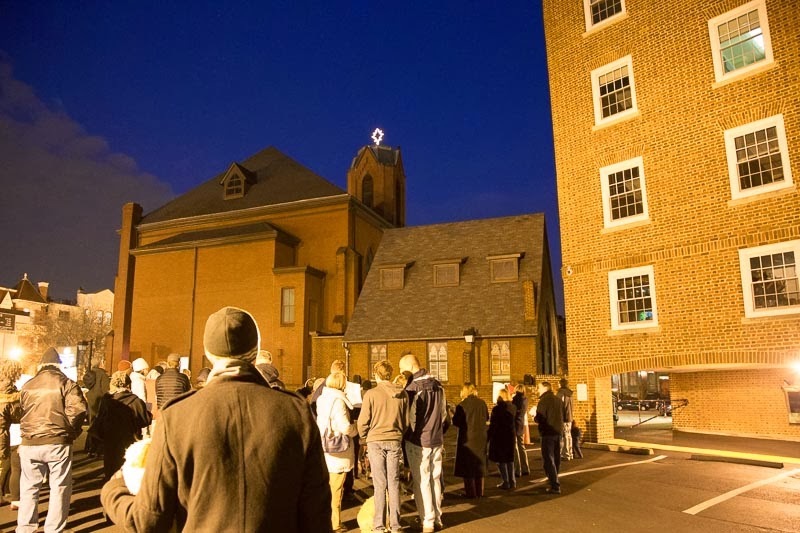 Last Sunday night on the First Sunday of Advent there was a community gathering in the parking lot behind our church when we drank Yuletide wassail, sang Christmas Carols, and lit a "Christmas Star" atop the church while singing, "We Three Kings." I think you can safely say we blurred numerous holiday and liturgical boundaries. Last week, on White House Elipse the National Menorah was lit, and last night on the other side of the Capitol Building the Capitol Christmas Tree was lit, later this the National Christmas Tree will be added to the Elipse. Similar celebrations and ceremonies are taking place all over the country and the world. My observation is this: something wonderful takes place this time of year as we light trees and candles, and buildings and fences, and boats, and shrubs. That "something" is a recognition and hopefully celebration of Light in our lives. Look up! Look around! Look within! Call it what you will - A HappyMerryJoyous season of Light is dawning! This is the day The Lord has made. Rejoice and be glad in it. Contrary to a couple of popular mantras, today is not merely the first day of the rest of your life, nor is it the "what if" last day of your life. Today is the only day. One of the daily gratitude programs I have been following in recent days has me pondering this as it poses the "what if" question in today's meditation. The meditation also links to a sobering and inspiring article that invites us into "today." I invite you to visit both links (actually the second one is contained in the first) and on this Thanksgiving Day Eve contemplate and integrated this timeless reality into our lives - Today is the only day. And have a great Thanksgiving Day! Early this morning I had "blogger's block" so I decided get my creative juices flowing with some physical exercise by raking the leaves. According to the DC Leaf Pickup Schedule ours should have already been out by the curb. However past experience has taught me that the DC Leaf Pickup Schedule is at best one big guess. As I raked and loaded leaves in a garbage can to carry to the curb (about ten trips worth), my imagination took flight remembering that not so long ago these same leaves had provided shade as we sat on the back deck enjoying warm summer mornings. I had watched the same leaves shimmer in early autumn breezes. And just recently they floated like big brown snowflakes to the ground awaiting our annual ritual of raking and hauling. It was like lulling away the morning with thousands of good friends. My early afternoon was spent putting up the star that has adorned the Capitol Hill Presbyterian Church tower the past two Christmas Seasons. With assistance from our Church Facilities Director, Robert Haywood, who was down inside the tower and me on top the tower the star was installed. It was a crystal clear day and the view from atop the tower was magnificent, a view of Washington, DC surpassed only by that from the Washington Monument. With the star installed I walked a couple of blocks to grab a late lunch. On the way back to the church I looked up to the tower and saw a very large bird perched on the edge of the tower looking up at the star. About that time I saw Garibaldi who manages the bank parking lot behind the church. He pointed at the bird and said, "It's an eagle!" "It has to be?" Garibaldi insisted. "But what if it's a buzzard?" "Makes no difference." He said smiling. "It's still a visitor from the sky!" Sure enough, regardless of what kind it was, a curious visitor from the eastern sky had come to see what the star was all about. The Christmas Star will be officially lighted at a community gathering on the First Sunday of Advent, December 1 at 5:00 pm. If you can, come join us and other visitors from the sky. Last Saturday, Nov. 9, 2013, a photo on the front page of the The Washington Post showed some of the unimaginable destruction from typhoon Haiyan in the Philippines. The aerial photo showed a coastal village strewn about like match sticks. My wife, Peg, pointed out an amazing detail in the photo - among the rubble and ruin were several clotheslines where survivors were already drying out. A friend and biblical professor at Mercer University, Rick Wilson, use to say, "The hope of the Gospel is that the worst thing is never the last thing." Human history confirms this as well. Regardless of natural events like typhoons and earthquakes, or self-inflicted destruction of oppression and war, or personal pain from disease and death; there is a Light of Life in all creation that always brings a new day and a new beginning, even though that path may be long and difficult. No matter how strong the winds and waves of life may be, clotheslines will eventually appear in the sunshine. "Worry is like praying for what you don't want." "I've had a lot of worries in my life, most of which never happened." 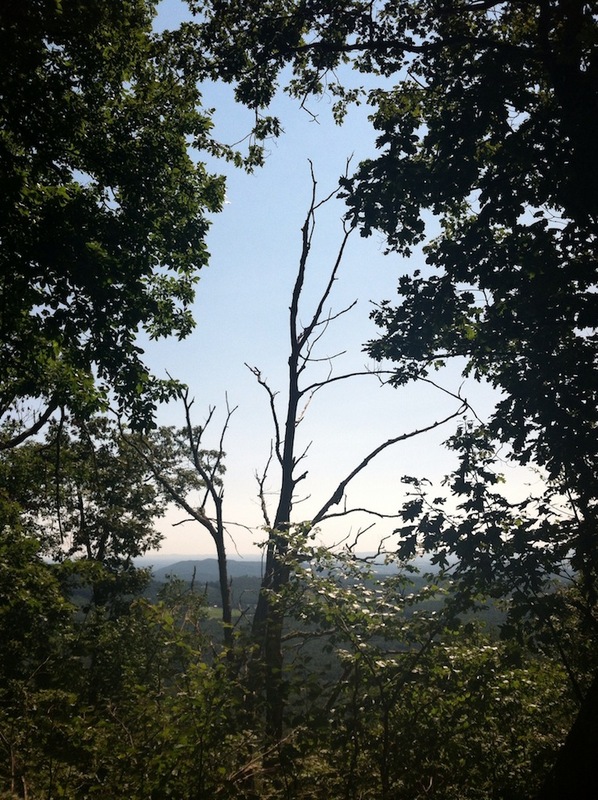 A daily blog I receive recently featured on different days the two quotes above on "worry." The first one especially caught my attention and spawned the question, "How often am I praying and don't realize that's what I'm doing? The vast majority of wisdom / spiritual / religious teachings and literature through the ages and from numerous cultures and traditions all contain elements of reaping and sowing, of cause and effect that can be stated in the simple cyclical formula: experience=thought=action=habit=experience. Another way to put it would be, the way we respond to our experience creates our experience. So what does this have to do with prayer? Prayer, without it's various formal religious contexts, concepts and rituals could be the process just described. It could be our consciousness perceiving, engaging, and communicating with a greater consciousness which seems to be outside us, yet at the same time in which we participate. And our participation shapes our reality. In the Christian tradition, Jesus says, "Do not worry about your life." and "Whatever you ask for in prayer with faith, you will receive." The Apostle Paul says in his letter to the Thessalonians, "Rejoice always, pray without ceasing, give thanks in all circumstances; for this is the will of God in Christ Jesus for you." Regardless of the circumstances of our life we always have choice, and in many ways the choices we make are the prayers of our lives. One of these choices is between "worry" and "hope." Depending on our choice, we may too often be praying for the exact opposite of what we truly desire. Even though most of us are focused on Halloween, the day after, the first day of November is All Saints Day on the Christian church calendar. It is traditionally a day to remember, recognize, and honor the people who have gone before us in life and in some way left a lasting impact, large or small. Today most people understand a saint as someone who has lived an exemplary good, compassionate, and pious life. It is considered to be a category reserved for a few. However, in New Testament times "saint" was used, especially by the Apostle Paul, in reference to people still alive and living their faith. He even addresses some of his letters "to all the saints of..."
So what if in the spirit of Paul we take All Saints Day and imagine it a bit further as a day when we remember, recognize and honor the Divine Promise in each and every human being, a day when All people are Saints, and we treat one another as such. Then imagine every day as All Saints Day. whatever is true, whatever is honourable, whatever is just, whatever is pure, whatever is pleasing, whatever is commendable, if there is any excellence and if there is anything worthy of praise, think about these things. Keep on doing [these things] and the God of peace will be with you. be transformed by the renewing of your minds, so that you may discern what is the will of God—what is good and acceptable and perfect. Recently a friend asked the rhetorical question, "Is anything going right in the world these days? ", then added, "The planets must be out of alignment or something." I must admit that I quickly agreed. But then I am reminded by words from my own faith tradition's scriptures that my thoughts, my perceptions, and my responses to what goes on around me determine whether the "planets are aligned" or not. So, no matter how dark or drear the world may look to you today, find one good about it and think on it, then find another, and another until a smile comes to your face. "When you're smiling, the whole world smiles with you." On Monday of this week I had the honor once more of delivering the opening prayer for a session of the U.S. House of Representatives as their Guest Chaplain. Last week when I received the invitation I posted on Facebook a simple question: If you if you had the opportunity to pray in 150 words for congress during this government shutdown, what would you say? God of Light and Life, our prayer today is simple. May the Eternal Spirit that embraces All Good deliver us from fear. be released from fear into freedom. as humans created in Divine Image. are affected by these decisions. when those convictions hinder the common good. to be a beacon of light for all people. Even though the prayer was written for Congress, in the end it is a prayer for fearless freedom, compassion, courage, humility, and clear vision in each of our daily lives. Today's is the 100th One Eternal Presence post and this week marks the two year anniversary of One Eternal Presence as a weekly blog. My thanks go out to each of you who read them, comment, and share with friends. To help me celebrate this milepost, take a minute and forward today's post to 10 friends who you think might enjoy getting them weekly. After several conversations yesterday with a few "non-essential" government employees I began wondering if any of us are really "essential" in the sense in which we use the word today. Is anyone's work, or cause, or purpose absolutely necessary? Millions of people die every day, yet the earth keeps turning and tumbling through space. Life in all of its multiplicity goes on. No one is indispensable. Yet, if we reclaim earlier understandings of "essential" we discover it's not about what we do but the essence of who we are. Our essence makes us unique yet inextricably interconnected with and part of a whole existence both visible and invisible. Our essence is the gift of life we have been given and the gifts of life we have to offer. No illness, furlough, government shut-down, or even death itself can ever define who we are as long as we know our true essence. We are all essential. As one walks the sidewalks and parks in Washington, DC on any given day you will encounter numerous people wearing badges. Actually I think it's safe to say there are more badges on the streets of DC than perhaps any other city in the country and perhaps the world. And, I'm not talking about badges of law enforcement. The badges to which I refer hang at the end of lanyards (some disappearing into shirt pockets), and are clipped to belts, purses, and backpacks. These badges identify people who work for our government, are contracted by our government, or are businesses and non-profits who work closely with our government - all providing vital services, many of which go unnoticed and unappreciated in our daily lives. Many of these people are my friends and neighbors. Some of you are reading these words right now. I was once myself a civilian employee of the Army for nearly 12 years before going to seminary and becoming a minister. In a sense as a pastor in DC my work is still closely associated with government because as most of our parishioners and participants are active or retired "badge wearers" during working hours. "Of course this is true of Washington, DC," you might say. Because it's a company town and the company is government. But the same is true no matter where we live or whatever size the city, town, or community. Our friends, neighbors, family, and perhaps even we are the clerks, commissioners, council members, maintenance people, planners, educators and citizen committee members of government in our communities. I have intentionally but not disrespectfully omitted firefighters, law enforcement, and military from this list because in many ways we already notice and appreciate them. All of this has really come home to me in the past week as our neighborhood of Capitol Hill was traumatized by the tragic shooting deaths at the DC Navy Yard. And now a little over a week later after the media frenzy, obligatory outrage, moments of silence at ball games, and solemn memorial services, we are left to ponder - who were the people who died and are the wounded both physically, emotionally, and psychologically? They were people who went to work on a Monday morning to jobs that perhaps they had done for years and were looking forward to retirement, or jobs to which they were new and thankful to have. They were and are mothers, fathers, grandparents, wives, husbands, partners, friends, neighbors all with hopes, fears, dreams, and imagination. They were the government of Abraham Lincoln "...of...for...and by the people." They were and are you and me. They are us. If you are a "badge wearer" I say to you right now, "Take it out of your shirt pocket and wear it proudly. Do your best to make it a badge of honor." But most importantly, I simply want to say, "Thank you!" Wherever you may live I suggest that today you begin noticing who in your community are wearing these badges of honor. And even if you disagree with their ideology or politics or governing style, say, "Thank you." They, you, we deserve it! In times of trouble, despair, fear and loss a place to which I often turn for comfort is the 23rd Psalm of the Hebrew and Christian Scriptures. I have done just that this week as in my own neighborhood tragedy visited the Washington, DC Navy Yard, then quickly echoed throughout the community and country. At the same time pounding rains feeding raging flood waters subsided in Colorado to reveal more loss of life, property and livelihood. As shocking and disturbing as these tragic events are in our communal lives, the pain and grief of those who lost family and friends is even more profound. It is times like these when we, the ones left behind, truly are in the "shadow of death." But we must remember, being in the shadow is not death itself. We are still here, painful and confusing as it may be at times. And, even though we are in a shadow, we know that somewhere there is light. However, sometimes the shadow is so dark, so faint we think we are in darkness. But because there can be no shadow without light, we know it is there - somewhere. So we turn, looking, seeking the light. In most spiritual and religious traditions the image of light is intertwined and often synonymous with the Holy, the Eternal, the Divine, God. In nearly every tradition there are teachings that this Holy, Eternal, Divine, God - Light is not only other and apart from us but also within each of us as the spark of life itself. So, when in shadows and we turn outward finding only more shadows, perhaps turning inward we discover the spark that is our own life waiting to be kindled. "...I will fear no evil for God is with me." “You are the light of the world...No one after lighting a lamp puts it under the bushel basket, but on the lampstand, and it gives light to all in the house. In the same way, let your light shine before others..."
Follow this like for a parable about light in our lives. Pearl Harbor, D-Day, Hiroshima, Nagasaki are "where were you" moments for my parent's generation. I was born seven years after the end of World War II. The images and words of these events in my personal memory come from the stories, books, photos, and movies of others where for the most part good guys were romanticized and bad guys were demonized. Yellowing folders of discolored construction paper from elementary school are littered with childlike drawings of planes, ships, and soldiers battling "the enemy." Audie Murphy and John Wayne were my heroes. It wasn't until October, 1962 that I would have my first and own "where were you" moment. Seared in my memory is the somber voice of President Kennedy talking about missiles in Cuba. Then there was Nov. 22, 1963. Five years later when I was 16 years old, and entire year was filled with personal "where were you" days and moments, among them: Martin Luther King, Jr., Robert Kennedy, and my own daddy's sudden death. There were also thousands of television images from a place called Viet Nam. "Where were you" moments are of course not always tragic. In the wee hours of a July morning in 1969, Neil Armstrong stepped on the moon. There were high school and college graduations. Then came the first time I saw my future wife, and our wedding day. The births of our daughters. An inner voice calling me into a new life of ministry. Twelve years ago today I sat in my car in the parking lot of the Forsyth, Georgia Post Office and listened to the early and confused reporting of a "apparently small" aircraft flying into one of the World Trade Center towers. There is an entire generation alive today who have a similar relationship with what we simply call "9/11" as my generation had with World War II. They have no memories of their own, only what they read, hear, and see - only what is passed on to them. My question today is simple. How do we remember, individually and collectively, not just 9/11 but all of the "where were you" tragedies of our lives in ways that honor lost life with integrity without perpetuating the dehumanizing anger and fear? Perhaps another question we can ask in not so much "where were you?" but rather "where are you?" "The disciple is not above the master." The Greek word for disciple is "mathetes" (math-ay-tes'), which means: a learner, a pupil, a student. It is the word Jesus used to describe the people who followed his teaching and example. The "disciples" were students and Jesus was their teacher. It is the season, and this week in particular, when millions of students of all ages from pre-K to graduate level in the U.S.A. and around the world are "going back to school." Classrooms, lecture halls, and seminar settings are alive with learning as teachers and students interact, share, and explore. Being students and teachers is not just confined to formal education or religion. Somehow the process of learning is innate in all creation. As information, knowledge, and experience are given, taken, explored, examined; then shaped, molded, and adapted in light of new information, knowledge, and experience - learning changes lives and the world. So as we enter the rituals of official beginnings of a "school year" perhaps it is good for us to remember that every day is the "first day of school" and all of creation is our classroom. Within every interaction we have with nature and every exchange with another person there is a teacher and a student learning together. And there is always the caveat of - who is teacher and who is student? "...go therefore and make disciples..."
I lift up my eyes to the hills— from where will my help come? My help comes from God, who made heaven and earth, who will not let your foot be moved. God who keeps you will neither slumber nor sleep. God is your keeper; God is your shade at your right hand. The sun shall not strike you by day, nor the moon by night. God will keep you from all evil; will keep your life. God will keep your going out and your coming in from this time on and forevermore. ...and indeed, it was very good. I'm spending a few days with some colleagues on a "pastor theologian" retreat in a breathtakingly beautiful setting on a hillside overlooking Estes Park, CO below with Long's Peak towering majestically above. Our mornings have been spent hiking the trails of the Rocky Mountain National Park. Afternoons have been filled with lively discussion of how we understand and experience God through Divine Names and good and evil. In the evening we have sat around a fire beneath a night sky so clear and close it seems you can touch it while banjo music, singing and laughter caress our souls. We are hiking some of the more popular trails in the park and so the trail head is rather crowed with people of all ages, hiking abilities, and intentions. However, it's not long before the crowds are dispersed throughout the numerous trails that branch out from that single path. Even still we encounter many people going and coming and in doing so hear numerous snippets of conversation. Two such snippets caught my attention yesterday. The first was a father with two small children as they took the alternate path across a small stream where stones were spaced just right for walking or hopping. The children were giggling, "We're going the different way!" as they gleefully hopped on the first stone. The father said, "Don't slip!" The first child immediately froze on the second stone and whined, "I'm scared." The second snippet came later in the day as we descended. While taking a water break we witnesses a young woman trip and stumble to her knees. We and several other people rushed to help her up - assistance she quickly rebuffed as she popped up and brushed off a skinned knee. Just a few minutes later the same young woman passed us on the trail and I overheard her say to trail mates, "I'm trying as hard as I can to not fall." This all makes me wonder about how early in life we learn risk aversion and how the very things we fear often become self-fulfilling prophecy. So, what are your aversions and fears, small and large? How many of them have come true? What would happen if you let them go and hopped to the next stone or stopped trying to not fall? You might get your feet wet or have to brush off a skinned knee - but maybe that was going to happen anyway. It seems that recently racial lines so many thought were beginning to fade in the sand have again become trenches of suspicion, mis-trust, and fear. In light of this, I share with you a couple of thoughts that apply not only to racial issues but all of our relationships. They come from a daily email I receive from the Church of the Savior here in Washington, DC., Inward/Outward - seeking the depths. Each person with his or her history of being accepted or rejected, with his or her past history of inner pain and difficulties in relationships, is different. But in each one there is a yearning for communion and belonging, but at the same time a fear of it. Love is what we most want, yet it is what we fear the most. As we ponder the importance of community as a spiritual discipline, it is helpful to remember that the model of community of Acts was not effortless, but rather the unfolding of mutual experience tested in the light of serious challenges and supported in God’s strength. We must develop a way to understand genuine community as the product of conflict and testing. We must discover ways to be authentically present to and respectful of one another while we disagree strenuously. We must learn to discover and speak our own truths, without fear and without harm to others who also hold a piece of the truth in which we all live. Today's message comes from the New Jersey Shore where a group of folks from Capitol Hill Presbyterian Church are working this week to do what little we can in the continuing recovery from last year's hurricane Sandy. Yesterday after hanging new doors in the home of an 87 year old man, he and his daughter told one member of our group they wanted to take us out to dinner. The group member explained that we already had dinner being prepared for us back at the Point Pleasant Presbyterian Church where we were staying. Then the old man, not to be stopped in his generosity, offered to pay for our work. The group member said, "That's really generous, but we're volunteering to help you. If you really want to give your money, find someone in your community who really needs it and give it to them." The exchanged moved the old man's daughter to tears. On another job several people were doing some painting for a woman whose home had not only been destroyed but looted after the storm. She lives alone and is constantly afraid of someone again breaking into her home. The organizers of our work reported that this woman has problems making decisions and is always changing her mind so that projects just can't seem to come to completion. Our group members reported that one of them was in constant conversation with the woman while the others worked. It seems as if she's also afraid of her repairs being completed because when they are - the workers stop coming. As with most mission trips there is usually confusion as to who is giving or receiving the "mission" or exactly what that mission is. In any case, generosity, gratitude, and comfort flow freely in all directions. Freedom ain't a state like Maine or Virginia. Freedom ain't across some county line. Freedom is a state that burns within ya. As we in the United States celebrate and contemplate freedom this week of Independence Day, may we remember that freedom is not a commodity to be given or taken, bought or sold. Nor is it a possession of any one people, government, or nation. One way of understanding the "Truth" of Jesus' teachings (word) is that the natural state of Creation has no boundaries, limits, or attachments; yet is interconnected and interdependent. The real cost of freedom then is surrender, letting go, and releasing illusions of separation. In unconditional relationship with God, each other and nature we experience true freedom. This is not license to do as one pleases, but rather a birthright to joyfully and responsibly participate in the whole of creation, free to be who we are created to be. Have a great and free Independence Day holiday! you and I are part of it. Feel the earth beneath your feet. I'm not sure when the fence went back up, probably for "crowd control" for the Memorial Day concert at the Capitol. I first noticed it only a couple of weeks after writing about it coming down. Anyway, there it was again blocking the newly groomed pathway. Last week some friends rode their bikes from Pittsburgh to Washington DC on the Cumberland and C&O Trails. Their last day on the trail was right after some pretty violent weather had come through the region. Numerous large trees had fallen all along the trail ahead, blocking normal passage. Did this stop their ride? Absolutely not! It simply slowed them down occasionally just long enough to lift their bikes over the natural roadblocks re-mount and keep on peddling. The Mall pathway and my friends' trail experience both remind me of all the obstacles that keep cropping up in our lives, especially those we create for ourselves (which is probably most of them). Just when we think we have released fear, anger, envy, or any other manner of keeping ourselves down and in place; just when we we think the pathway is clear, up pops a familiar fence. Should we let it stop us? Absolutely not! Fences, trees, and fear are only obstacles when we allow them the power to keep us from walking, peddling, and living. Privacy and secrecy are in the news a lot lately, and it has me wondering: Is there a difference between privacy and secrecy? Privacy is defined at meriam-webster.com as: the quality or state of being apart from company or observation, freedom from unauthorized intrusion, a place of seclusion, secrecy. Notice how each is used to define the other, yet they are different. Assuming the opposite of private is public, and the opposite of secrecy is transparency, I think most people when asked will insist on private secrecy while usually demanding some measure of public transparency. However we seem to live in a world where private lives are made more and more transparent, most of the time voluntarily, ie every time we post on Facebook, not to mention "reality" TV. While public institutions (all of them not just government) are becoming less and less transparent, ie countless layers of bureaucracy, out-sourcing, and obsession with security. Now what does all of this have to do with our spirituality or faith? Maybe the tension between these dynamics permeates our lives because we live in a time when the commonly accepted, and quite modern, illusions of public and private are being challenged and renegotiated. I use "illusions" because the great enlightened teachers of most spiritual and faith traditions have taught that the private and public are not separate but always interconnected and interdependent. One place where this relationship between private and public is taught are the teachings of Jesus in The Sermon on the Mount (Matthew chapters 5-7) . Here Jesus shows us numerous connections between our inner and outer lives. Take a few minutes and read the entire Sermon on the Mount and see if you make the connections as well. FYI - when you use the link make sure you click through to chapters 6 and 7. It's no secret - our inner and outer lives are connected in ways we are yet to imagine. How many of us ever really take time to "wait a minute?" A few seconds perhaps, but a whole minute? This summer at Capitol Hill Presbyterian we are beginning each Sunday worship service with 3 minutes of "silent preparation" which translates in Presbyterian as "eternity!" Silence is part of and essential to our well being. It is found in some form of fashion in nearly every spiritual tradition. Yet it is so rare in our culture. Or, is it? Perhaps, like so much of life, it is all about perception. What if we begin to re-imagine silence as not so much the absence of sound but rather our stopping and waiting long enough to actually hear (or see) what is taking place in the moment? Or in the case of silent preparation for worship, simply pause to clear our minds for what is happening and about to happen. The same can be done before a meeting, or a phone call, or replying to an email. How would your life change if throughout the day you really took time to "wait a minute?" ...in any situation, you can always ask the question, where's the emptiness in this? Where's the emptiness in this? And in any moment or situation where we find this gap, where we find this sense of everything's not just one long sentence that isn't even punctuated…it's in those moments where actually there's a quietude. That's when new life and fresh ideas can come through us and into the situation. Now there was a great wind, so strong that it was splitting mountains and breaking rocks in pieces before the Lord, but the Lord was not in the wind; and after the wind an earthquake, but the Lord was not in the earthquake; and after the earthquake a fire, but the Lord was not in the fire; and after the fire a sound of sheer silence. When Elijah heard it, he wrapped his face in his mantle and went out and stood at the entrance of the cave. Then there came a voice to him that said, "What are you doing here, Elijah?" We join spokes together in a wheel,but it is the center holethat makes the wagon move. We shape clay into a pot,but it is the emptiness insidethat holds whatever we want. We hammer wood for a house,but it is the inner spacethat makes it livable. We work with being,but non-being is what we use.